Ramesh has been part of the Common Ground sangha since 2006 and joined the Board of Directors in 2016. 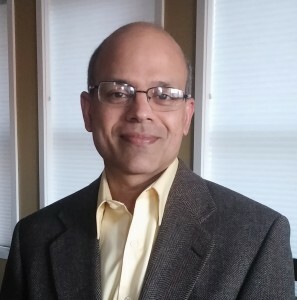 He is a Geriatric psychiatrist and has a deep professional interest in understanding the complex and dynamic interplay between our minds and bodies that often underlie many physical and mental health illnesses. His spiritual practice too is guided by the Buddha’s advice about the deep wisdom inherent in our bodies – “within this very fathom-long body, with its perceptions and inner sense, lies the world, the cause of the world, the cessation of the world and the path that leads to the cessation of the world.” He shares some of his experiences through workshops at Common Ground on mindfulness and chronic pain, and finding wisdom in our bodies. He is drawn to Buddha Dharma by the simplicity and universality of its message, and its focus on practice and self-reliance, without the compulsion to believe specific creeds or dogmas. He especially values the importance given to ethical conduct, compassion and generosity. To listen to Ramesh’s talks, click here.